Blessed by early December snow storms and sunny bluebird days during the Christmas-New Year’s Day span, Lake Tahoe area resorts saw the biggest holiday crowds in four years. “The ski resort business in the Sierra over the holiday period was up substantially over last year, and the resorts had more people coming since the holiday season in 2010-2011,” said Bob Roberts, CEO of the California Ski Industry Association. Cold nighttime temperatures during most of December allowed the resorts to generate plenty of additional snow with snow-making systems that resorts have been expanding in recent years. In years gone by, many Sierra ski resorts collected a third of their annual revenue during the Christmas holiday season. But now, explained Roberts, a resort may generate half of its annual ticket sales with the early season sale of annual lift passes. Many skiers and riders have discovered that if they only get out on the slopes five or six days a season, that pretty well pays for the price of an annual pass, he added. All of the 27 ski resorts in the association had enough snow to open for the holiday season. Enjoy the ultimate holiday experience to Heavenly Mountain Resort this season, where twirling ice skaters, chainsaw-sculpted ice displays, and world-class fireworks will stir up the energy of the holiday season in Heavenly Village. Co-produced by Tahoe South, the fourth annual Heavenly Holidays will feature 12 days of festivities beginning with photos with Santa in his snow globe and ending with a glittering New Year’s celebration with the sparkling Gondola Drop to ring in the New Year. With more snow storms in the forecast and the power of the West Coast’s largest snowmaking system behind it, Heavenly is proud to provide holiday guests with fantastic snow surface conditions for skiing and riding. After experiencing Heavenly’s 3,500 vertical feet of terrain above soaring views of Lake Tahoe, guests continue their adventure with daily festivities in Heavenly Village, leading up to the final blow out at the New Year’s Eve Celebration. Santa’s Workshop Snow Globe – December 20-24, 2:00-7:00 p.m. Enter Santa’s 16 foot snow globe to share your holiday wish list and snap a photo with the man himself. Ice Skating Spectacular – December 28-30, 7:30 p.m. Unique performances featuring some of the best figure skaters in the country will take place at the Heavenly Village Ice Rink. Fear-No-Ice Sculpting – December 28-30, 10 a.m. and 2:00 p.m.
Catch the chainsaws in action while Heavenly Village gets a makeover with dazzling ice sculpture displays by talented artists each day. New Year’s Eve Celebration – December 31, 6:00-9:00 p.m. The pinnacle of Heavenly Holidays will come alive with the celebration of the New Year. The Fire Groove fire dancers will be spinning flames to a live performance by Wes Quave, while the energy of the night continues with games, face-painting and a photo booth to archive all the amusement of the night. The “Fear-No-Ice” sculptors will bust out their saws to carve their crowning glory for the New Year. Heavenly’s Gondola Drop will descend over the crowd at 9:00 p.m., when families celebrate in concurrence with the midnight Ball Drop in New York City’s Time Square. The brightly lit gondola cabin soars over the crowd while the fireworks dazzle in the sky above, capturing the wonder of kids and adults alike. Guests looking to go all in on New Year’s Eve can gear up for a full night in the variety of clubs, bars and casinos that South Lake Tahoe is famous for. Book a Heavenly Holiday Vacation! Heavenly Mountain Resort is the ultimate holiday destination, with 12 days of vibrant events, 3,500 vertical feet of skiing and riding, and endless dining and nightlife options. Visit www.skiheavenly.com for details on vacation packages. EpicDay Lift Tickets: Buy Online. Skip the Line. EpicDay Lift Tickets offers up to 25% savings on advanced purchase lift tickets at Heavenly and across Vail Resorts via the new EpicDay Lift Tickets platform. Tickets can be purchased through an easy-to-use online and mobile site, www.skiheavenly.com/epicday, and picked up at an EpicDay Express Ticket Pick-Up window at the resort. Additional days can be added online, avoiding a return trip to the ticket window. EpicDay Lift Tickets reward advanced planning with the lowest guaranteed price and less time spent in the ticket line. 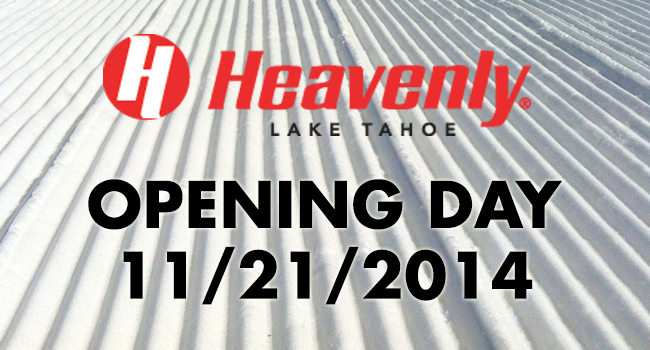 Opening Day is Friday at Heavenly Ski Resort! The countdown to the 2014-2015 ski and ride season is almost over. The first skiers and riders of the season will load the Heavenly Gondola at 9 a.m. Get here early and stay late- they’ll be raffling off free snowboards, skis, Smith goggles, and a GoPro in the Gondola line and at Unbuckle. The Gondola and Tamarack Express will give access to 14 acres and 1.5 miles of skiable terrain on California Trail to Tamarack Return. For park fanatics, there will be a variety of terrain park features on the left side of California Trail. Ski and ride school will offer a few different lesson options. For specifics on what those products are, give our school a call at 1-800-HEAVENLY, press 7. Heavenly’s snowmaking team has been hard at work making snow whenever the wet bulb temperature allows, and our grooming team has taken advantage of the huge whales (piles) of snow to cover the trails and prep the lift ramps and access areas for opening. Opening Day kicks off at 8 a.m. at the bottom of the Gondola in Heavenly Village with a live DJ, the Heavenly Angels, giveaways, and free Heavenly Donuts. Get there early because the first 100 guests will get Heavenly Swag and will be entered into a pre-opening raffle for a pair of skis or snowboard. At the first Unbuckle at Tamarack après party of the season at 3:30 p.m., the first 100 guests will also receive a raffle ticket for a pair of skis or snowboard, a GoPro and Smith goggles, as well as Hard Rock Hotel and Casino swag. The California Base Lodge will be available for free parking. We will be running free shuttles every 20 minutes between the Cal Base and the Gondola. In partnership with Ski Lake Tahoe, Thomas Cook Airlines has today announced the UK’s first non-stop air service, from London Gatwick (LGW) to Reno (RNO), with the first flights taking place in December 2015. The twice weekly service to Reno from Gatwick, opening up a host of ski holidays for UK travellers, departs on Wednesdays and Saturdays. The flights begin on Dec. 19, 2015 and runs until 9th April 2016. “It’s fantastic news that we’re able to offer skiers from the UK the first ever non-stop flights to Reno-Tahoe, opening Lake Tahoe as a real option for their winter break. On top of our new routes to Miami and New York next summer and our brand new Premium cabin, we’re leading the way in offering a quality experience at great prices for the discerning traveller heading to the USA,” said Christoph Debus, CEO, Thomas Cook Airlines. Andy Wirth, the Vice Chairman of the Reno-Tahoe Airport Authority, said the combination of incredible skiing and Reno-area casinos will make the new flight a unique and unforgettable experience for travellers. Reno-Tahoe International Airport is one the closest airports to major ski resorts in North America. Passengers can see ski runs from the airport’s runways upon landing and it is a quick 45 minute to 1-hour drive from airport baggage claim to the ski lifts. The flight will be contingent upon approval of landing rights by the U.S. Customs and Border Protection. Lake Tahoe is where North America’s largest concentration of World-class ski resorts lie within majestic mountains featuring jaw-dropping cliffs, serene glades and stunning views. Skiers can choose from Heavenly, Kirkwood, Mt. Rose-Ski Tahoe, Northstar California, Sierra-at-Tahoe and Squaw Valley | Alpine Meadows. With 400 inches of snow a year and over 600 unparalleled runs with 113 lifts on 17,000 acres, Lake Tahoe is a skiing and snowboarding paradise, with endless ways to have fun après ski. Thomas Cook Airlines has recently released further details of its new cabin experience for customers on its Airbus A330 long haul fleet, with brand new Economy and Premium services bringing a great value product to long haul customers on its flights from May 2015. To view a film of the new Thomas Cook Airlines cabins click here. In addition to 2” of natural snow during the weekend, Heavenly Mountain Resort has fired up the West Coast’s largest and most powerful snowmaking system and has begun making snow in anticipation of a Nov. 21 opening day. The snowmaking system ran for seven hours over night Sunday, blowing snow at the top of the Gondola, as well as on California Trail, Orion and Tamarack return. Heavenly’s extensive snowmaking system is capable, under optimum conditions, of producing three-and-a-half feet of snow across one acre in an hour and can cover 73 percent of the resort’s 97 trails in machine-made snow. Heavenly is expanding its snowmaking capabilities this season by adding snowmaking to Easy Street, a beginner run at the top of the Gondola. A spur line has also been added from the top of Dipper Express that allows Heavenly to make snow on Skyline Trail near the top of Milky Way Bowl. This will make it possible to open Skyline Trail earlier in the season and provide skiers and riders access to both California and Nevada earlier than ever before. The resort also added three new fan guns to the fleet, increasing the total number of energy efficient fan guns the resort has to 67. These new SMI Puma fan guns are more energy efficient and also more efficient on the production side. Heavenly kicks off the 2014-15 ski and ride season on Friday, November 21, with opening day and the first Unbuckle at Tamarack après party of the season. Unbuckle takes place daily from 3:30-5:30 p.m. with a live DJ, half-priced drinks, giveaways, food specials, lots of dancing and, exclusively on Thursdays, Fridays and Saturdays, the lovely Heavenly Angels. The party continues with Winter Ignite on the weekends of December 5-6 and 12-13, culminating in a free concert by Young The Giant in Heavenly Village on December 13 at 7:00 p.m.
Winter Ignite will jumpstart the 2014-2015 ski and ride season with pop-up DJ Cat and Unbuckle après kick-off parties, the Pretty Faces movie premier and comedy from Daniel Tosh at MontBleu Resort Casino and Spa on Friday, December 12. For more information, go to skiheavenly.com/winterignite. Powering through the snow, we entered a washed out world of grays and off-whites. We felt as if we were riding in the clouds, which we were, cruising at 9,000 feet in the crisp, cold air of the High Sierras. Some riders were disappointed that we wouldn’t be able to see the crystal blue waters of Lake Tahoe below us, but the surreal scenery made me glad that we had taken a day off skiing to try this snowmobile tour with Zephyr Cove Resorts. The gray mist even muffled the sounds of the powerful snow machines. We glided silently through the High Sierra glades. The towering pines looked like pieces of art, decoratively layered with crisp, white snow. It seemed more a dream than reality. After a week of skiing and snowboarding in the many resorts around Tahoe, we were ready to try something different. Maybe even a little less strenuous to give our sore muscles a chance to rest. Everyone agreed on snowmobiling, so we checked out the tours available from South Lake Tahoe and picked Zephyr Cove Resort. The tours leave from the resort, which is only four miles into Nevada from the state line.